"One thousand lawyers paid at least £100k a year from public purse." "The Legal Aid fat cats: SIX barristers each earned more than £500k from taxpayer last year." Barristers are due to strike on Monday over government proposals to cut £220 million from the sum taxpayers pay annually towards legal aid (currently around £2 billion). Today two papers carried stories which might have left some readers wondering about the motivation for the strike: public duty or private purse strings? According to the Mail and Express, hundreds of lawyers are earning hundreds of thousands of pounds each year from the current system of legal aid, with the top earners taking home over half a million pounds. The stories are based on a new 'ad hoc' statistical release from the Ministry of Justice, which tots up the number of barristers receiving payments funded from the public purse of various values. The figures do match those in the newspaper reports: in 2012/13, a total of 1,275 barristers received payments worth £100,000 or more, with six earning at least half a million pounds from publicly-funded schemes. The mean fee income for the 4,931 barristers identified by the Ministry of Justice as having claimed money through legal aid schemes is £72,000, while the median is £56,000. However we do need to be a little careful about how we interpret this data. Most importantly, the government statisticians are quite explicit that the figures "do not represent the personal earnings of the individuals listed in any one year," a point seemingly missed by both the Mail and the Express. The reason for this owes much to the way legal fees are paid. One important nuance to the data is that payments made to barristers under certain government-funded schemes might be for work on a case (or cases) that stretches over several years. High-value transactions in particular could well represent a number of years' 'earnings' for the barrister concerned. Another problem with reading the data in this way is that some payments received by a single barrister may eventually have ended up divided between the wallets of several of their colleagues. As the Ministry of Justice release says, "the amount attributed to a barrister may include payments subsequently made to other barristers as remuneration for work carried out on [their] behalf." In certain cases, the money claimed through legal aid by barristers may have been returned to the taxpayer after costs were recouped from the opponent. 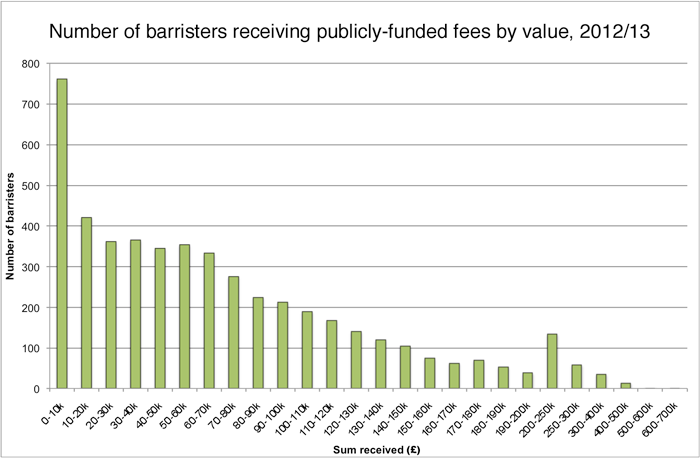 While all succesful claims for publicly-funded fees made by barristers were included in the data, the Ministry of Justice does point out that "in some cases where the costs are recovered from the losing party the actual cost to the fund may be small or even nothing." Without further information, we don't know what proportion of the fees listed in the statistical release might be connected to these sort of scenarios, and therefore we don't know how reliable a picture the data gives of the amounts actually taken home by barristers. However we do know that these caveats are sufficiently important for the Ministry of Justice to explicitly warn against matching the figures to individual barristers' annual incomes, guidance which has sadly been ignored by both the Mail and the Express. Update: One reader has been in touch to point out that the Ministry of Justice figures also include VAT - which has to be repaid to the government - and any expenses and disbursements claimed during the case for which they were paid.